Titles include Cable/Deadpool #10, Daredevil #68, Exiles #56, Fantastic Four #521, Invaders #5, Madrox #4, Marvel Age Fantastic Four #9, Spider-Man: India #2 and Spider-Man/Doctor Octopus: Year One #5. Justice League Unlimited: Saving the World -- Season 1 Vol. 1 will be released on DVD on Feb. 15 from Warner Home Video. * "Initiation": A reluctant Green Arrow joins forces with the new Justice League to stop a rampaging nuclear monster in Asia. "Hawk and Dove": Wonder Woman teams up with super-powered two brothers, one warlike, the other a pacifist, to stop Ares? plans to escalate a European civil war into World War III. "Kids? Stuff": Superman, Batman, Wonder Woman and Green Lantern are transformed into eight year olds in a desperate attempt to save the world from the magics of Mordred. Special features include�"Save Gorilla City" menu challenge, "Justice League Watchtower Database," "Superhero Intern" and "Keepin' Up With the Joneses." 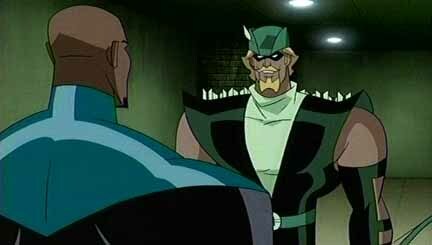 Click on the thumbnails for larger images and look for more on Justice League Unlimited soon here in The Continuum. Moonstone Books has released its solicitations for April. Blade: Trinity, the third movie in the franchise featuring Marvel's vampire hunter, opened in some 2,900 theaters on Wednesday. The film will be hard-pressed to open at No. 1 like its predecessors, with Ocean's Twelve opening in 350 more theaters. But with a by-itself Wednesday opening, it could find a niche in the holiday season. An industry analyst told The Continuum it should do at least $60 million overall. Although it has been billed by New Line Cinema as the last Blade film, Blade: Trinity does leave an opening for another movie. It also opens the opportunity for a Nightstalkers film featuring Ryan Reynolds (Hannibal King) and Jessica Biel (Abigail Whistler), who both have said they are interested in reprising their roles. * Parker Posey, who plays Danica Talos, appeared on the syndicated Ellen on Thursday morning. Posey explained how she got into character. "It kind of started with the hissing," she said. "A lot of it was wardrobe. I would talk about what I would wear. Then they dyed my eyebrows blonde. They sprayed my face with the whitest makeup. And then I had these color contacts in." * Triple H, who plays Jarko Grimwood, appeared on Fox Sports Net's The Best Damn Sports Show Period on Wednesday night. The professional wrestler said he did all his own stunts, except where Blade kicks his character through a door. He related a story when he was nicked by a gun in the cheek during a fight scene with Reynolds. "It was the most embarrasing thing," he said. "They stopped production, shut everything down to bring paramedics in to look at my face. And I had to tell the director, 'Dude, don't tell anybody I work with that you guys made this big of a deal out of a little nick. I'll never hear the end of it.'" * Below are photos from the film's premiere in Hollywood on Tuesday night. Among those attending was Leonor Varela, who starred in Blade II. The second Teen Titans DVD from Warner Home Video will be called Teen Titans: Switched -- Season 1 Vol. 2. According to Marvel Comics, New Avengers #1 has sold out. Another printing will be available next week with a Joe Quesada variant cover. The cover features the original sketch, now inked and colored, that served as the inspiration for the first printing's several alternate covers. The Wednesday, Dec. 22 episode of The WB's Smallville will be "Facade."